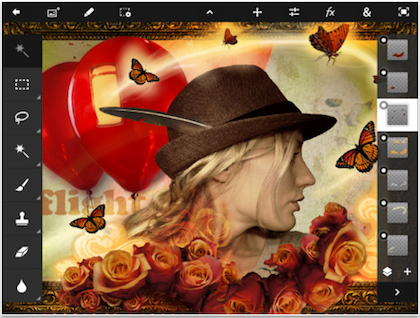 You saw the news right – Adobe has released a iPad2 version of Photoshop Touch! Adobe finally got their iPad version of Photoshop up on iTunes, “Photoshop Touch“. It has all of the key things modern apps have to have; cloud services, share on social services, AirPrint wireless printing and layers… layers… layers. The ‘layers’ is what we wish more apps had but generally you work on photos and drawings on the iPad at a core level so there is not undoing a change five steps ago without undoing everything. Layers lets you apply changes to a singular area of your creation that can be altered independently without effecting everything. Photoshop Touch also has filters and tools. Images have a maximum of 1600 x 1600, and Photoshop Touch only works on the iPad2. Original iPads and iPhones need to apply. We are looking forward to the scribble enhancements that got so much press prior to this release. Scribble out what you don’t want or need changing and Photoshop Touch is smart enough to know what should be there instead. This week will be seeing a lot of our images thrown at the app to see just how well it works. Pretty exciting new iPad tool!